The CEO of an Aberdeen-based catering company has picked up the Food & Drink Entrepreneur of the Year trophy at the Grampian Food Innovation Awards. 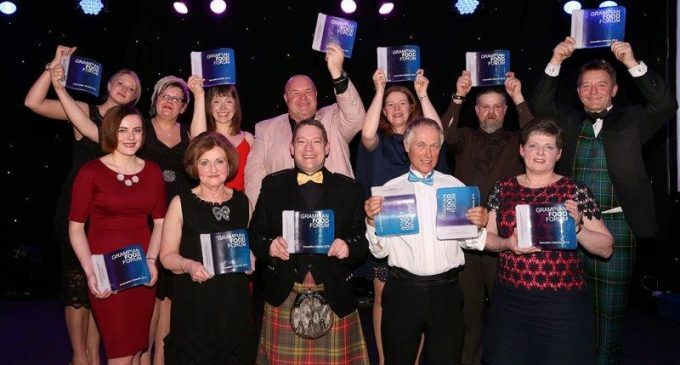 Peter Bruce, head of CIS Excellence Awards Hospitality Educator of the Year sponsor, Entier Ltd, scooped the accolade at Aberdeen’s Mercure Ardoe House Hotel last week. Celebrating innovation in food and drink from businesses across Grampian, the awards recognise innovation in both creative start-ups and established players. ‘We are proud of our commitment to supporting our local community,’ commented Peter (pictured, back row centre). ‘Seventy percent of the produce we use is Scottish sourced, with 95% of that coming from Aberdeenshire and the greater Grampian region. ‘We believe in the quality and innovation of food and drink companies on our doorstep and are keen to support this across all areas of our business, from weddings and events to our delivered catering and remote sites’.